With a big bag of awesome organic carrots in the fridge, I couldn't stop with just one carrot recipe (by the way, in case you don't know, carrots should never be put near apples in the refrigerator -- it'll make the carrots hairy and bitter, just like Robin Williams' career). It being Hanukkah time, I was inspired to make something vaguely latke-ish. Into a bowl went half a diced white onion, two very large diced roasted garlic cloves, four small grated red potatoes, and a large grated carrot, and that got mixed. In went a couple tablespoons of almond flour and a couple of white flour, salt and pepper. It honestly could have used a little smoked paprika or hot pepper powder, a little zing to balance the flavor profile, but I didn't think of it. Then we got to the eggs. Because it's utterly cold here, the chickens aren't laying, so I haven't been able to get eggs from our local growers' co-op, Idaho's Bounty. I got my usual backup store brand, Eggland's Best, but stupidly didn't open the carton until tonight. You can see what's coming. I removed the eggs that weren't egg-white-glued to the walls of the carton, then used a knife to halve open the eggs that weren't broken but couldn't be removed, and used a spoon to scoop out what egg interiors I could before throwing the rest away. In total, I think approximately 4 and a half eggs got into my latke mix. I started with a medium-heat fry pan, with a tablespoon or two of olive oil, and added my first batch. After some experimentation, I ended up on the higher end of medium-high by the last batch, with about half a tablespoon of olive oil per batch. Being kind of a salt junkie (though don't think that means I'm absent a sweet tooth -- the fiance brought home white, dark and milk chocolate Lindor truffles on Saturday, and I've been having a really hard time staying out of them! 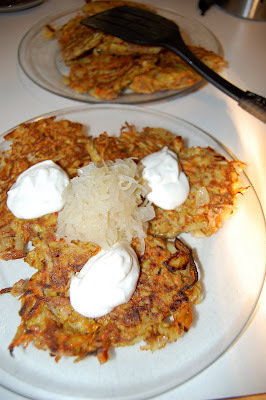 ), I topped the latkes with sour cream and sauerkraut. Which was absolutely perfect. The chilled pickled cabbage was utterly delicious atop the hot, crispy latkes. So there you go, my carroty Hanukkah experiment. Now I need to figure out what to make for Kwanzaa! 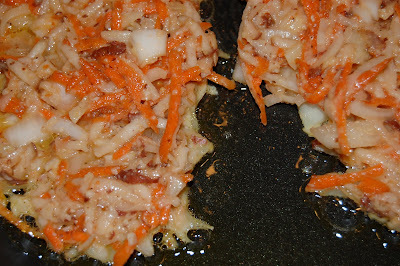 For another latke recipe using sweet potato and lingonberry, click here. Akitcheninbrooklyn.com is doing a roundtable on carrots for the month of December. 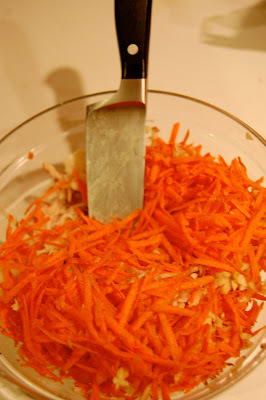 For additional carrot recipes, click here for my Sweet Gingery Carrots.